Campus Ministry isn't something we do - it's something we are. UniLu has a mission (and an ethos) to be a community for students, faculty, and staff of the various colleges and universities around us. UniLu has Sunday School, nursery care, Adult Forum, and intergenerational worship and service activities. This means, students find surrogate parents, grandparents, siblings, and children, and find a non-evaluative place to be themselves, to learn, worship, socialize, and work for justice with other members of the community. This home-away-from-home-away-from-home is a place for encountering other students, professors, alumni, neighbors, and friends all in a setting that is not in the classroom. The leadership of the congregation is often in the hands of students. Our Church Council is made up of many university-affiliated folks (three of the last six presidents of the congregation have been students), our Fireside Room is available as a student lounge, students take an active role in worship leadership, and several of our programs have students in leadership roles. 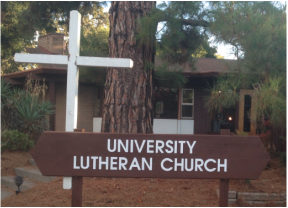 UniLu is one of hundreds of Lutheran Campus Ministry sites across the US affiliated with the Evangelical Lutheran Church in America, giving us a relationship to several Lutheran Campus Ministries in California and across the country. See more on the Young Adults page of this website.